After driving north-eastwards from Las Vegas, our first stop was in the pretty town of Springdale. 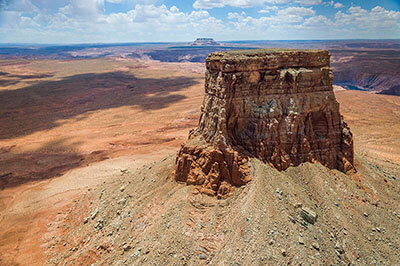 Nestled in a valley, it is the gateway to one of the most beautiful National Parks in the US. What makes this a more special visit is that visitors are bussed into the park, rather than being able to drive their own vehicles in. This avoids the issue of chaos and cars. Shuttles run regularly from several locations in the town. There are a number of drop off points in the Park up and down the river valley depending on where you want to go and what you want to see. The views on either side are breathtaking and majestic and immediately made us wonder why we hadn’t booked to stay in the area for more than our scheduled two days. Having done a little homework beforehand about what we had planned for the day, we set off, crossed the river and began our exploration. As a photographer, there are photo opportunities everywhere, from the light falling on the rocky summits to the lovely vivid flower colours of the cacti. 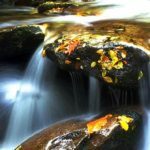 There are streams and small waterfalls allowing for that always needed cooling off station. By hiking higher, the walks can be a vigorous as you like or you can be content staying low by just following the river up or downstream. 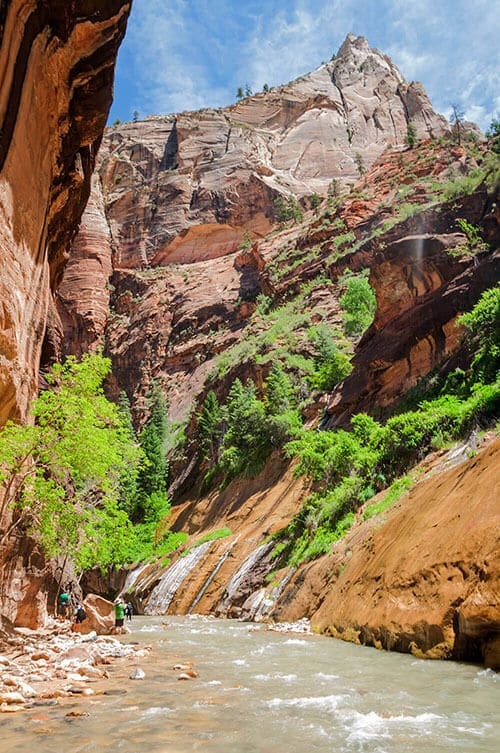 The last stop on the shuttle drops you at The Narrows, rated by National Geographic magazine as one of the greatest hikes in the world. Walking The Narrows is not for the faint-hearted or foolhardy, as it involves walking virtually the whole route in the water – sometimes up to chest height (I’m 6ft+ tall). Check river levels and likelihoods of flooding with the authorities before you go. It can be dangerous after high rainfall. Before embarking on this quest, it’s highly advisable to wear the special water shoes available to hire locally, and most importantly also hire a hiking stick. This is vital to help you keep your balance in the rougher parts of the river. You can walk as little or as much as you like to get the experience; I covered about two miles, but if you’re up to it and start early enough there are about seven miles. Be prepared to face the crowds in peak season and take plenty of water and snacks. Carrying camera equipment was challenging at times, but you can’t hike this without wanting to document the experience. Just a few hours drive from Zion is Bryce NP. As we approached the area we were enthralled by the deep red colour and amazing shapes of the rock formations. With no prior knowledge of Bryce, the 5.30am arrival for a sunrise view at Sunrise Point was met with a damp squib. Just here for a day and our only chance of that gorgeous morning light of this incredible amphitheatre was slightly dulled! But, remember, cloudy overcast conditions are often the best for moody, contrasty photography. Never mind, this happens. The weather was not going to dampen our spirits. We waited for later in the day and eventually saw the sun light up the stage and got our photos. 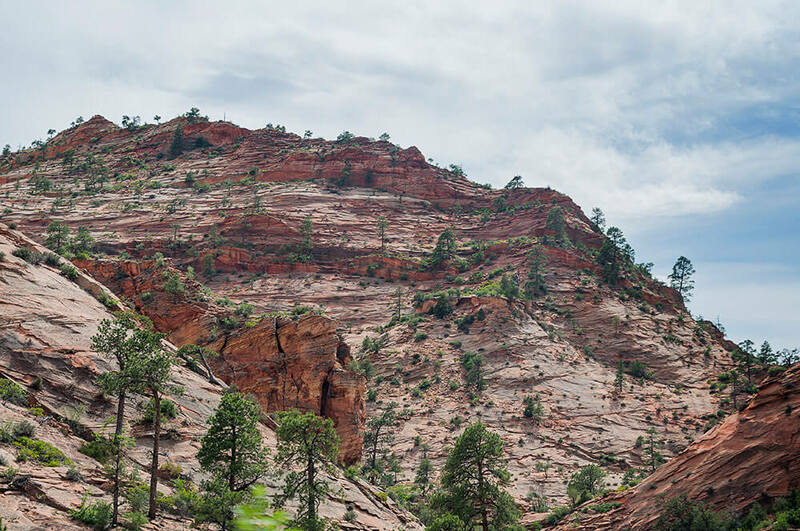 Wanting to immerse myself in this environment, I hiked down into the very hot canyon and walked many of the trails. Meanwhile, my friends chose to take an easier route down, on the back of mules. Due to the high iron content in the rock, lightning strikes are commonplace here where many trees lie gnarled and twisted where they were struck. This is one of the most amazing places I have ever seen. 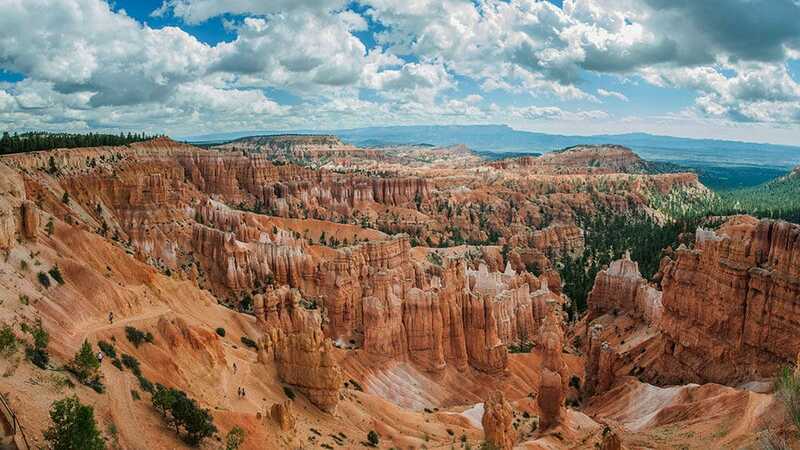 Experiencing Bryce Canyon has left us with wanting more of the same, and time on this trip didn’t allow for a second day there. It might have been worthwhile to increase the chances of getting those quality sunrises and sunsets! A trip down the Colorado River is one of those things most people will do when visiting the area. And, on this occasion, I decided to combine the river tour with a helicopter ride. This ride left from the small airport in Page and took us to Tower Butte, a rock buttress standing 1000ft tall in the open desert 10 miles east of Page itself. Tower Butte is an example of an Entrada Sandstone formation and is so totally unique that there is nothing else like it in the world. 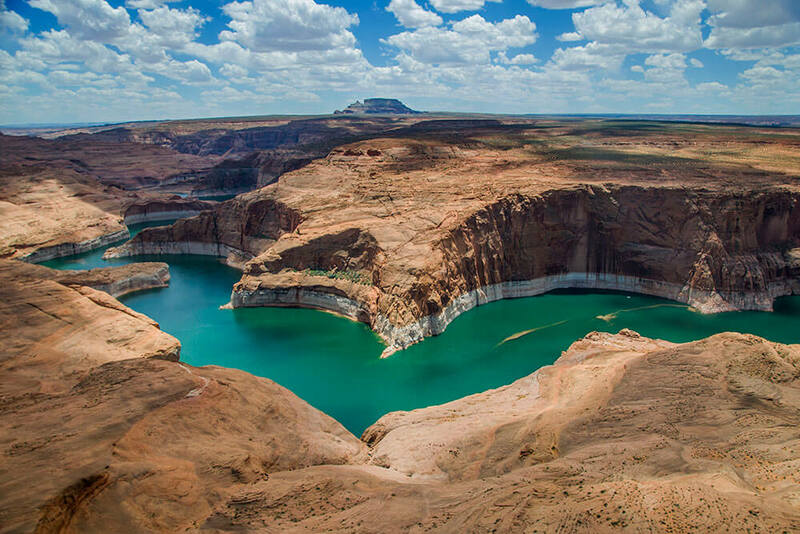 The views of some of Lake Powell’s inlets were breathtaking as we flew across some and down others. This is a wonderful way to see the beauty of this vast unspoiled area (apart from the Navajo power station built so many years ago). After 15 minutes we approached Tower Butte and gently touched down on this extraordinary oddity in the middle of nowhere. The area of ground on top measured about 10 acres and had sheer cliff edges all the way around. Views from this elevation were amazing, taking in large swathes of the lake itself and back towards the flatlands around Page. Having wandered around taking photos and chatting with the young pilot for 20 minutes, it was time to return to base. Now came an exhilarating highlight of the ride. Gently lifting off and flying sideways to the edge of the Butte, we suddenly dropped down vertically as if falling off the edge. If you’re not sure whether to do this ride, do it! You’re only here once, and I promise you won’t regret it. After a short bus journey from Page towards Glen Canyon Dam, we enter a secure area where we’re driven through a special tunnel which traverses down just inside the cliff edge towards the base of the dam. Once at river level, we find our rafting boat among dozens of others. Each raft takes about 12 people. We set off floating down this majestic river which has carved its way over millennia through the canyon. On occasions, we had to use power to navigate rougher waters as we continued downstream. Stopping at interesting points on the river’s edge along the way, we witnessed ancient rock carvings and learned about the early explorers and their exploits from our well-versed local guide. After a while, we appeared at Horseshoe Bend, but this time we were on the water rather than on the viewing cliff face 800 feet higher. Tomorrow we would be up there looking down on where we are now! 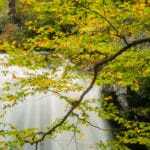 The water colour was a glorious green, reflecting the ever-changing light, which made taking photos more challenging. On the return leg of the ride, we used power all the way back to the dam. From Bryce, our journey took us south and eastwards towards Page in Arizona. On the way we passed miles and miles of unusual rock formations, and also had a fleeting view of the purple Vermillion Cliffs. Then we were confronted with a stunning view of Lake Powell with the evening sun shining on the far cliffs and rock outcrops. This is where we were going to spend a night. The next day was one I had been anticipating for months. With two well-known attractions nearby, Antelope Canyon and Horseshoe Bend any photographers visiting either or both are in for a real treat. My pre-booked tour of the lower canyon was for the ‘Photographers Tour’, while the others in the party chose the basic tour. 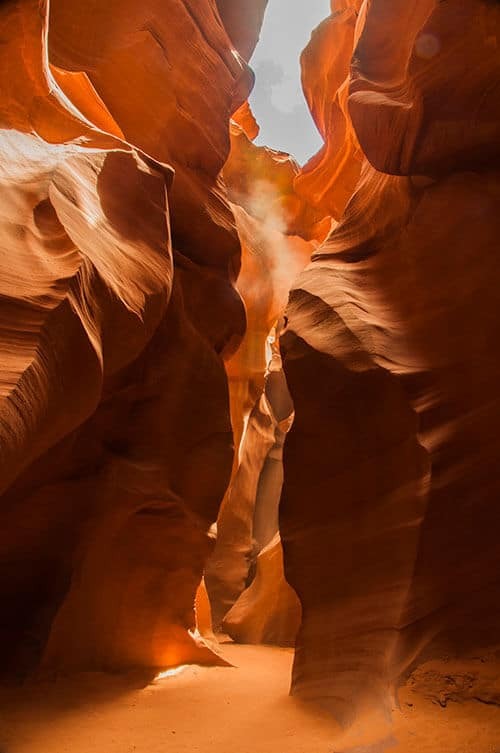 If you have seen photos of Antelope Canyon before and want to create similarly or just love your photography, then the ‘Photographers Tour’ is a must! 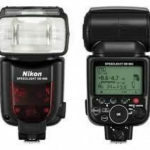 To qualify, you must have a DSLR camera and tripod – no point-and-shoots or smartphones (they must go on the normal tour. 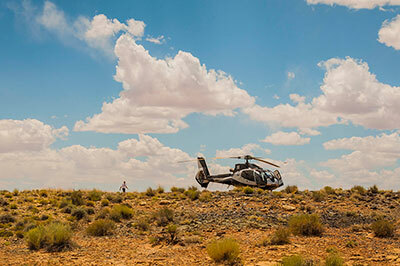 The advantage of this premium tour is that you will have priority over the simple tour whilst in the canyon. You can take your time setting up your tripod and shooting without people getting in the frame. The tour is also much longer. *A few notes of caution*: It can get very dusty in the canyon, so protect your gear as much as possible and try not to change lenses more than necessary, if at all! Take a rocket blower and lens brush with you too. *Final tip*: To achieve the pink/purple colours associated with images taken here, set your white balance to ‘cloudy’, and I’m sure you’re already shooting in RAW, if not, then DO! This extraordinary location is only a few miles out of Page and the walk to it from the car park takes about 15 mins. This is one of the most stunning places to visit. Whether you’ve seen photos from here before or not, you are bound to be moved when you see it for real. The enormity of the beauty that the Canyon holds is awe inspiring with the snaking emerald of the Colorado river deep below (about 600 feet into the canyon). Most keen photographers undertake a certain amount of research about iconic or fascinating places before they visit them. I certainly did on both Horseshoe and Antelope Canyon. But, there will be others vying for best spots on the cliff edge to get the right shots, so it’s a good idea to visit during the day beforehand. Then, when you’re setting up for your sunrise or sunset shots, you’ll know where the prime locations are. Be careful as you will be very close to the edge. Also, winds can cause havoc as you try to stabilize everything – I had to tie my rucksack with some heavy lenses in it to weigh down my tripod. 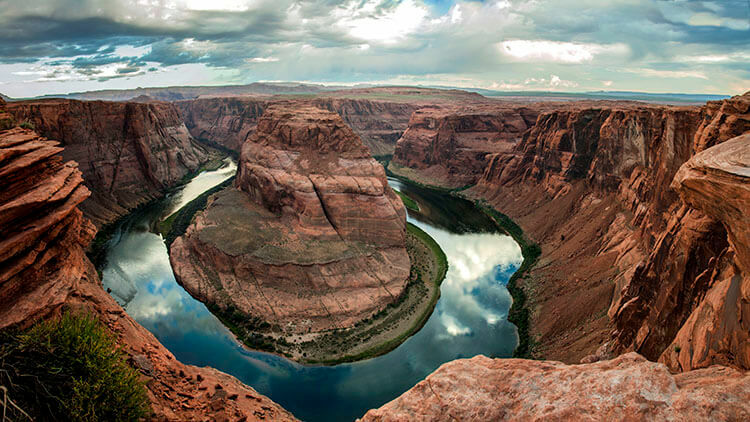 What proved to be a photo challenge at Horseshoe Bend was trying to fit in the entire vista of the bend into one image. I had read that a wide angled lens would be best, so took one (Nikkor 28mm f/1.8), but when I tried it I was not able to get the shot needed. I reverted back to my kit lens (Nikon 24-105mm) and planned to take several panoramic shots which could be stitched together later in Photoshop. There are few words that one can say on seeing the Grand Canyon for the first time. If you have no church, then I’m sure this will suffice. The scale of it is mind-blowing. 15 miles across the chasm from the south to the north rim and one mile deep! Our first encounter with this great wonder occurred a few miles east of Canyon village itself. We turned off the main road to see the sunset over this magnificent vista. Much to my surprise, I came across a stag grazing near the cliff edge. With a little patience, perhaps he would come out of the shaded thicket into this glorious sunset. 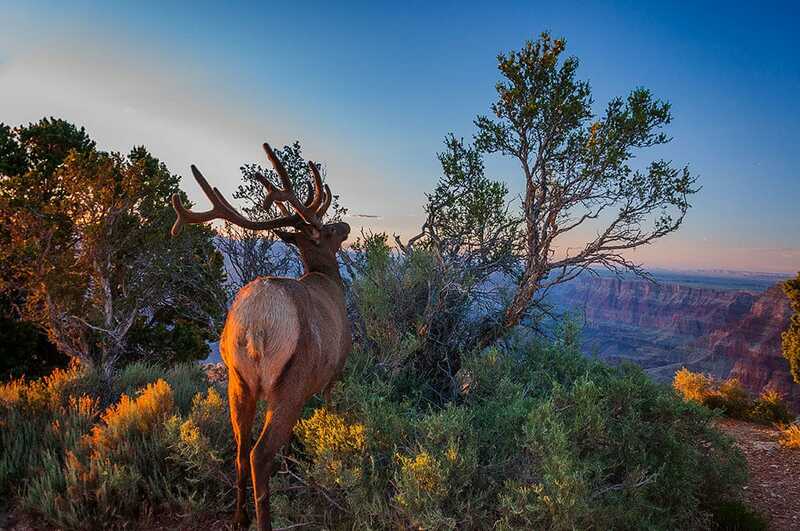 He soon did and displayed his magnificent set of antlers with the canyon as a backdrop. The next morning we decided to rent some bikes and tour along the south rim. This was a good decision, as we could set our own pace and stop when we wanted. There is no better way to experience the vastness than to peer down and see the river many miles below. Cycling further along, we noticed that many of the cactus flowers were in full bloom. From bright purples to gentle yellows they decorated the bleak rocky outcrops with their prickly beauty. 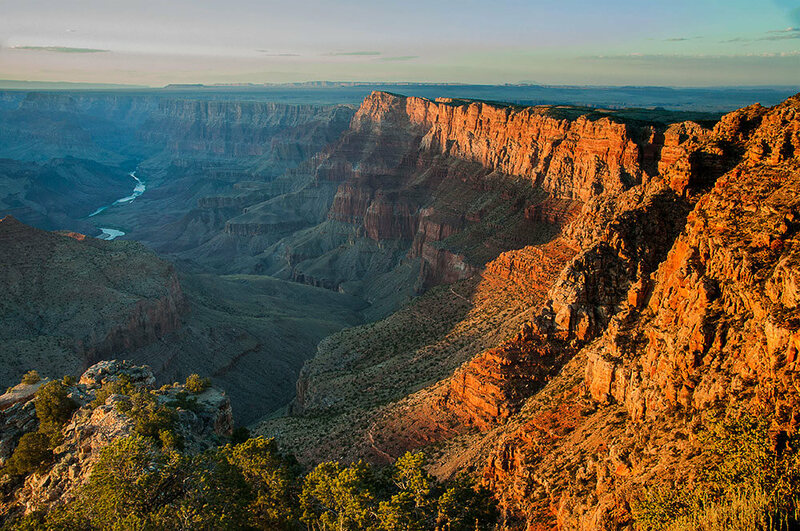 There are so many pictures of the Grand Canyon opportunities to be taken. And, don’t forget to keep your wits about you in any close-to-the-edge encounters you may have. We could have stayed here for several days, but the next stop was to be the Hoover Dam near Las Vegas. Taking the odd detour on our way to experience a little of Route 66 was well worthwhile. What extraordinary places, stores, and people lay in our wait! Having seen a documentary on the building of the Hoover Dam in the 1930’s, I had to come to witness what is the legacy of those amazingly brave workers. It had to be one of the greatest of engineering projects ever undertaken back then, with many hundreds of people losing their lives in the process. When looking at the dam for high up over a very windy walkway, it’s hard to comprehend what is actually happening below the water surface. The two gigantic towers were phenomenal in their design and construction. We arrived too late for a tour but were able to walk around part of the complex. One feels very small in an environment such as this and forever wonders at its construction. This was one amazing trip which could easily have been spread out over ten days rather than five! Have you done a road trip and/or experienced any of these locations? 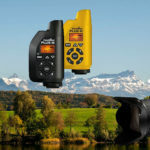 If so, we would like to know what your thoughts were or anything special you encountered in your quest for good photos. We look forward to hearing about them, and thanks for dropping by!